Big E with some fans... who look to be about 13 years old and in their pajamas; kind of creepy. Them's what were called 'Bobbie Soxers' in standard dress. Slacks with (usually dad'd) white shirt, tails out, sleeves rolled up. Go back and look at Frank Sinatra clips from that era, you'll see masses of them. I am nowhere near old enough to know about this. Yep, Bobby Soxers. Photo taken in 1956 in St Louis. 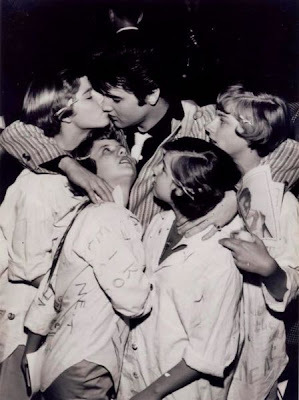 Considering Elvis stood about 5'11", I'd say the girls are mid to late teens. And he'd be around 21.